For anyone who isn’t familiar with the show Dinosaur Train it’s geared at young kids, probably pre-school age, and all the characters are dinosaurs. The show teaches some basic values such as the importance of friends, family, sharing, and other good qualities. 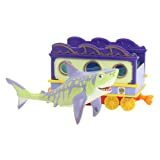 This dino figure comes with a rail car so it can attach to the other cars and ride along with its dinosaur friends.